The lovely Amanda and Susan of Wego Health had a few questions for me after winning the Offline Crusader Award. I thought I should answer these questions in my final health activist challenge blog. 1. How/why did you become a Health Activist? Tell us your Health Activist story! My wonderful husband Fred died in painfully after suffering for weeks from inadequate pain management and suffering the emotional despair of being disregarded and repeatedly injured due to lack of coordination of care and continuity within his medical record. On top of this, we were not allowed access to his electronic medical record in the first facility he was cared at. We were told we must wait 21 days and pay 73 cents per page to see the story of his care. Then they told us we could go home to die. That is when my husband told me to “go after them.” I have never stopped going after them and will never stop until we change the health care system in the United States and make it more patient-centered. 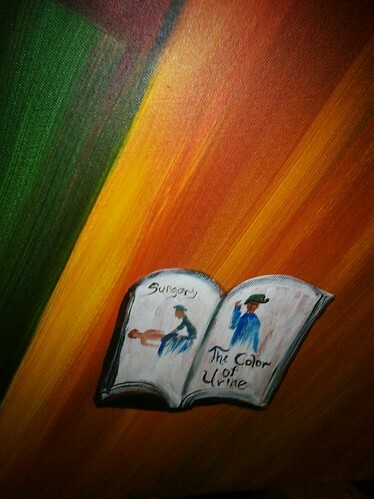 After painting my husband’s story for all to see, I began to paint other patient stories. 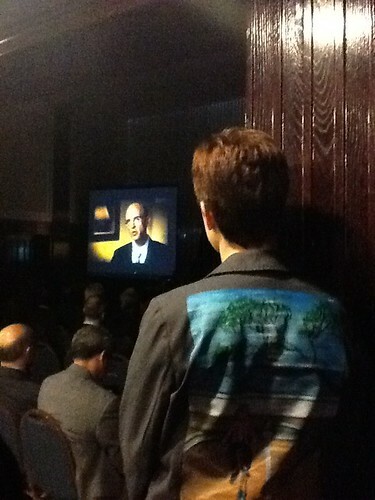 These stories make up a patient advocacy movement called The Walking Gallery. 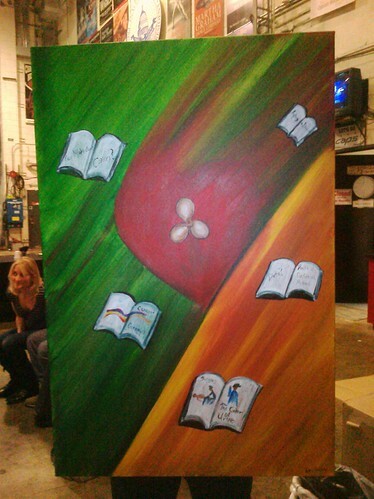 There are over 140 painted stories in The Walking Gallery at this point. Far too many represent the story of a life cut short due to medical error. 2. What are your goals for Health Activism in 2012? I want patients to have open and real-time access to their electronic medical record. I want to break through the silos that separate us. We must treat the patient as a whole person and the care model must be designed that way as well. I want us to culturally accept conversations about death as part of life. I want the 2012 Wego Health Award winner’s to include a few more Speaker’s for the Dead. I think I am the only one this year. I want to see more artists, poets and musicians presenting at medical conferences. 3. What awareness event or effort are you most excited about in your condition? Would that be the human condition in which we all share? Meaningful Use, check it out. It is a game changer. 4. If you could tell other Health Activists a few things about your condition and your community, what would you want them to know? Be supported by your community, but do not silo yourselves within it. Join other tweet chats and other facebook groups. We all have more in common than you think. Those that do not wish to embrace a patient centered model of care like us separated. We are small and easily defeated when complaining within echo chambers. We are many united, and under the banner of patient there is nothing we cannot accomplish. I would like everyone to submit public comments to Meaningful Use Stage 2 specifying that patient access to the electronic medical record should be in real-time, supported by access to an online patient portal. The entire Electronic Medical Record (EMR) should be open to patients and their family caregiver including Doctors Progress Notes, Nurses Progress Notes, Medical Administration Record, Medical Reconciliation Report, Labs, Imaging, Active Care Summary and After Discharge Summary. In addition, provisions must be made so patients can also submit amendments and their own personal data and add patient progress notes. The important people were here. They hung framed as faces on the wall at the National Press Club. The entire venue was dressed in marble, old polished wood, brass details and heavy drapes. Here were the symbols of the establishment: the status quo, the exclusive club. Within the room we filed in row, cameras pointing forward to the stage. The room was filled with tall beautiful people. Many were elder statesmen in their fields, their silver-white hair a testament to their years of labor whilst toiling for the good. They were doctors, aviators, scientists, and researchers. They were reporters, government officials and CEO’s. This summit day focused on Health Information Technology at a cross roads with Patient Safety. The speakers came to the summit, taking time from their busy schedules to address the assembled, catching the last flights out of town in order to speak on this day. The day began at 8:30 in the morning as we viewed the documentary produced by TMIT (Texas Medical Institute of Technology) and The Discovery Channel: “Surfing the Healthcare Tsunami: Bring Your Own Board.” I set up my easel in the back of the room and my eyes touched upon the backs of those assembled. Even in the darkness lit by the flickering film, I knew many of those backs. They wore their souls as paint on fabric. I knew them not by their job titles, but by their struggles. In this room were the disadvantaged, the ones who were barely getting by. Some received care due to Medicaid, some worked long hours and still cared for their relatives. 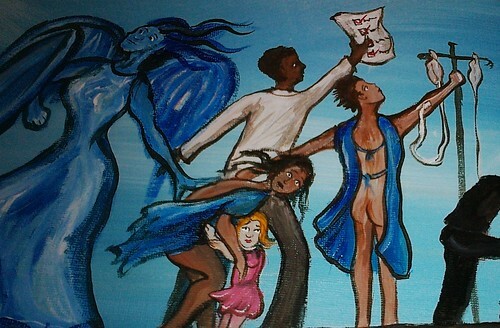 Some faced discrimination for their interests, their gender, their sexual orientation or the color of their skin. These who sat in a room of greatness had faced a crucible of pain. I painted the movie and the meeting. I was honored to witness the combination of many talents join together to reach a greater understanding of the immense struggle we face in reducing healthcare harm. Here was technology, health and information combined. 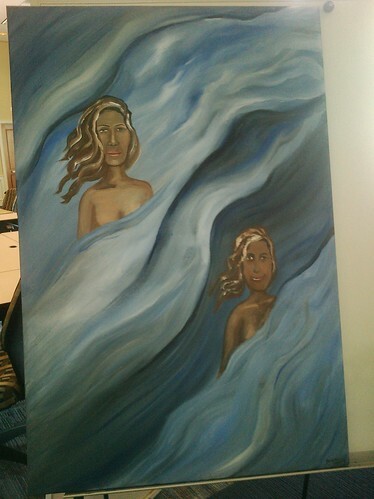 I began the piece by painting with sharp brush stokes the oncoming wave. 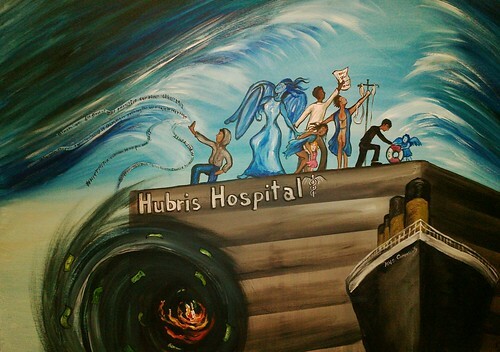 In a riot of attacking blue the waves descend upon a hospital building. I have been to many small towns where the hospital is the largest building. If there were a tsunami wave descending, I would scale the heights of the hospital and hope for the best. 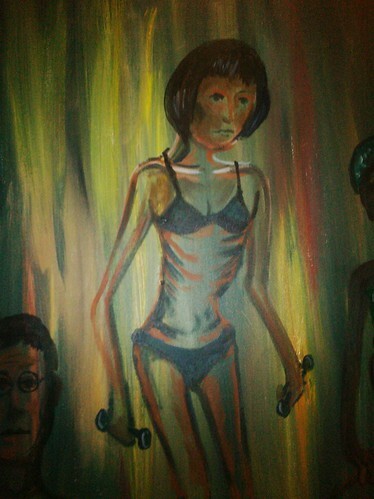 While painting this I noticed that every person tweeting the hashtag was female. I don’t think I have ever seen a twitter stream focusing on HIT so thoroughly dominated by women. Then, I looked at the panel currently speaking consisting mostly of men. I thought at this moment what a great unifying force technology brings. The voice once silent at the podium loudly comments online and the ripples of her thoughts spread far and wide. Protecting the crowd on top the hospital are two blue angels. To the left, the larger fierce angel represents the “Blue Angels” themselves. Here the tools of aviation are arrayed in opposition to healthcare harm. As Dr. Charles Denham, our moderator and creative force behind TMIT, asked Aviation safety expert John Nance, “What if we had a NTSB (National Transportation Safety Board) in medicine?” What if every surgery had a black box? What if errors were revealed within days to the whole world so they would not happen to others? Fellow aviators like Dennis Quaid work toward this end. Months before his twins were harmed, the same medication error happened to other children and resulted in their death. Failure is great teacher. We remember with crystal clarity the worst moments in our life and the knowledge gleaned from mistakes made can be taught to others. 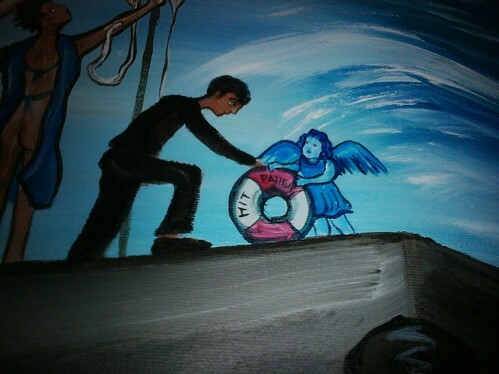 Below the guardian angel, a young patient stares at us. The wind of harm is almost blowing the gown off her back and her hair whips around her head in frenzy, but still she huddles protectively over a child younger than herself. Behind her a doctor holds a surgery checklist defiantly toward the wind. To the young girls right, another patient stands. His Johnny gown is open and he holds his IV staff as though it is a battle standard. To the far right a little blue angel stands. She is Emily Jerry. She was mistakenly given a chemotherapy solution with 23.4% sodium when the amount should have been less than 1%. She died a painful death at the age of two. Eric Cropp, the on duty pharmacist responsible when a technician under his supervision made an error, went to jail. 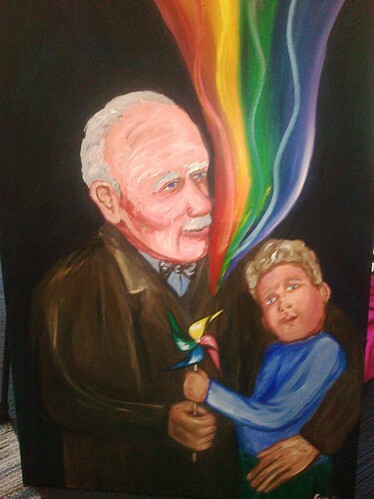 Emily’s father Christopher founded the Emily Jerry Foundation to support patient safety. Christopher publicly forgave Eric and speaks with him at medical conferences. Christopher believes we should focus less on blaming individuals and focus more on the system that allows such errors. Emily is holding a life preserver that says HIT and patient. Throughout much of the day we heard about the power of technology to catch error, but the patient and family can act as a double check as well. So Emily hands this life preserver to a pit-crew member. NASCAR has learned the power of teamwork and transparency in keeping drivers alive. Medicine must do the same. 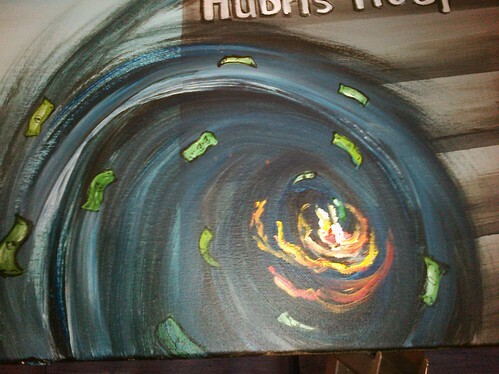 Below and to the left of our crowd a black vortex swirls inward spinning money toward flames. This is our current payment model: a fee for service system paying for additional tests without requiring proof continuity of care and positive experiences. Here are quiet malpractice settlements with non-disclosure orders. Here is a dark silence that kills, while money burns. To the right of the vortex is the HMS Community, a ship based upon the Titanic. We gather this day to stop the ship before it sinks. We must redirect before iceberg hits or the oncoming wave capsizes this massive structure. If we fail a great deal of people will die and the majority of them will be those in "steerage." My late husband and I saw that film in the theatre. It showed true love in a moment of utmost despair. I am not talking about the relationship between the protagonists Jack and Rose. No, I speak of the mother in steerage. When she realized there was no way out for her and her young family she went back to her small cabin and read them a storybook. As I read my Fred the Dark Tower, as Lewis Blackman read Dune, we read alone in hospital rooms as the ship sinks around us. The power of the story can offer solace in our deepest despair. But story can do far more than that. Stories once told will spread, changing systems of care as well as s systems of thought. 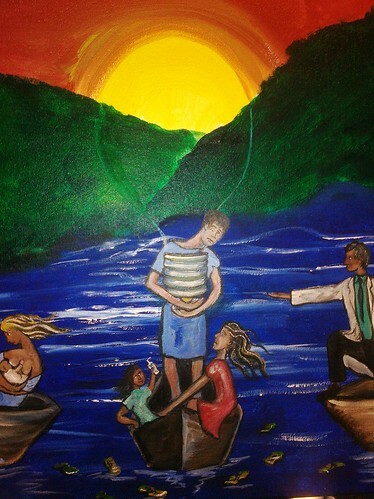 So this day, this painting, this documentary and all the speakers on Speakerlink.org encapsulate the patient stories that stream above the waves. The stories will escape to build the world anew. 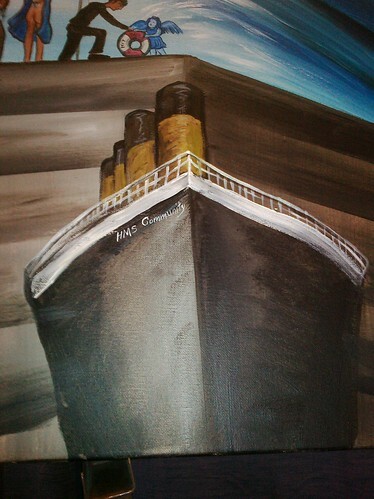 Yes, Hubris sunk the Titanic. The Hubris that bigger and better was an end in itself, and the designers of that ship disregarded the potential of communication technology. But Hubris is more than just an over inflated sense of pride. It is the subjection of those who are powerless by those in power. It is harming those who cannot speak for themselves whether they are little Emily’s or men in open Johnny gowns. 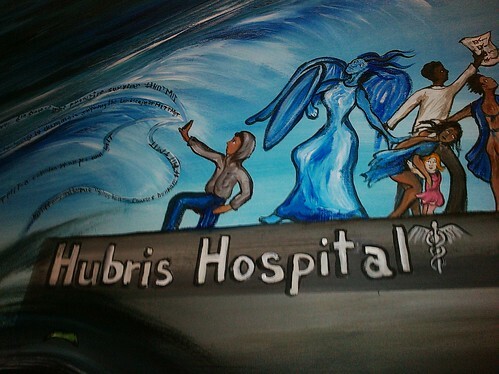 So within this painting the building is labeled “Hubris Hospital” for we are at a crossroads. We are at the collision of technology and tradition. Technology is sharp. It is made of glass, wire and hard data. When it presses against inflated egos and the rounded comfort of custom, it will pierce. Leave this post inspired to act. Comment now on the proposed rule of Meaningful Use Stage 2. Make sure the patient voice is front and center. Watch this Documentary and act upon it. Join your local Hospital Board or patient advisory board, join Speakerlink.org. Whatever you do, speak up. Be the siren that warns against the wave. When I was I was child, the summers were hot and the basement was cool. Somedays the mercury would rise to 115 degrees. I would look into our backyard and across the alley. Above the black asphalt parking lot behind our house the air would ripple like smears of grease on a television screen. Inside it was sweltering and fans whirled in some vague attempt at cooling the seven rooms of our house. There was one window unit air conditioner fighting a losing battle in the dining room. The unit rattled and you could keep cool if you stood right in front of it. I often thought the air conditioner was most appreciated by the patch of green moss that lived outside. The moss was fed by the continual drip of water droplets from the condenser coil. But there was a cool basement below us. Perhaps I should call it a cellar rather than a basement. Some our friends had inside basements with upright entrance doors. Those doors led to descending staircases well lit with electric light. Such basements were often the playroom or family room and were carpeted even if they occasionally smelled of damp. Our basement had a slopping cellar door and looked like a storm cellar. At the age of eight, I could barely open the heavy door if I strained with all my might. When opened, strands of spider's web would waft in the breeze as a rush of cool musty air arose from the open door. Each step down was made upon chipping concrete surrounded by cellar walls consisting of a mismatch of sandstone and brick. At the base of the stairs the light from the sun above lit a five foot radius. I would descend into darkness and even at my child's short height, I would need to duck beneath the trailing spider webs. Then eyes blinded by the bright outside sun, I would shuffle barefoot across the dark expanse toward the dangling incandescent light. I would wave my had in front me and would feel the metal ball chain, and gratefully pull it. Snap. The light came on and a dull amber glow filled the dark dank space. The basement was bi-level. Within our rectangular basement an L shaped area was somewhat finished with concrete floor and a sump pump drain. The sump pump hummed within its inky darkness and the floor around it was sloping and wet. The area of the basement that was not part of the L was a raised earthen embankment two and half feet above the floor. The walls of the embankment were concrete and were edged with supporting pillars for the house above. These pillars were made of Oklahoma sandstone, old bricks from the brick plant and steel pipes. I would heft myself upon the raised embankment and crawl between the pillars to a little play kitchen I had created along the back wall. Here was a small basement window, but I pretended it was kitchen window. The window let a little stream of light into the space. I had taken a few pieces of old of rusted iron parts and had fashioned a few "burners" on my sandstone stove. There I would "cook" with my toy dishes and picnic with my dolls in a room that smelled of the grave. Have you ever crawled in the cool dirt of an unfinished basement? There is an musty earthiness, a quiet stillness. Every once in awhile a ray of light from the small window would alight upon a rock and I would see the mineral sparkle of the stone. I would see the sparkle in the darkness. There were spiders down there in the basement. Hundreds of brown recluse spiders surrounded me while I played. There was mold and damp and darkness, yet I will never forget the sparkles of the stones in a shaft of light or the wonder of play. You can make something out of darkness. You can let the space you are in define you or you can make it a better place. Not long ago someone posted a comment on the facebook page of a patient community I belong to. He said the documentary "Chasing Zero" (a joint production between TMIT and the Discovery Channel) "exudes syrupy hope confidence of people who are trying to help improve the medical system." He added it would make some patient activists sick to watch. In a few short days the second documentary in that series will premiere in DC. 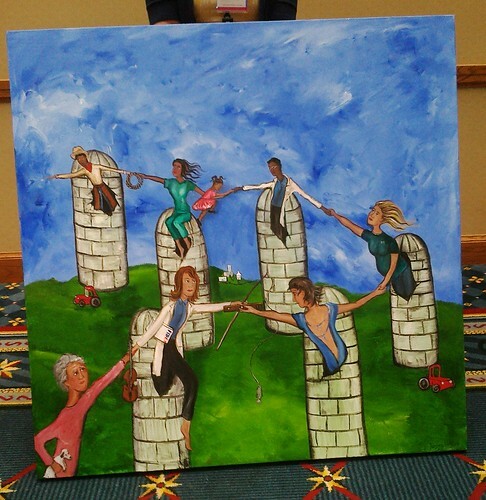 I am one of the patient advocates featured in "Surfing the Healthcare Tsunami." I would not say we are are syrupy. We have gone beyond anger, but refuse acceptance of the status quo. We truly believe by working together, patients working with providers, we will create system change. No, I am not a syrupy, but I do see sparkles in darkness. My flight had been delayed and now I was three hours late for the Arkansas Quality Conference in Hot Springs. As I prepared to jump into a a handicapped accessible taxi in Little Rock, I asked the cabbie if it was okay to take me when I was not handicapped. I was the only fare waiting, so he said hop in. I buckled myself in the back seat and tried to converse over the large open space designed to hold a wheel chair. My feet dangled like a child from my high seat. After a few minutes of conversation, yelled across the gulf between us, I asked if I could sit in the front. I twisted my body over his center console and dropped into the seat as we sped down the highway at sixty miles per hour. 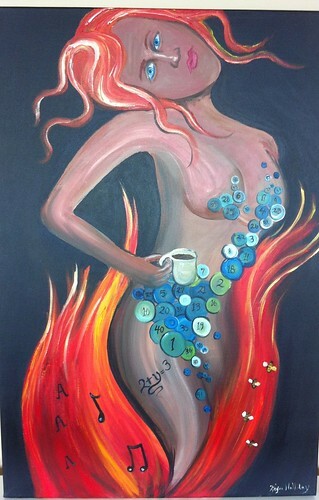 Then I heard the cabbie's story, for we all have stories and some of us paint them on our backs. His daughter died of cancer 20 years before. She was only nine years old. We exchanged condolences. He had been an enlisted army man for 20 years. When he left the service, he found the only job available was long haul trucking. On the lonely road he would eat and eat and rarely sleep, then he had a heart attack. No more trucking for him, or the income he gathered at that job. He recovered and lost 100 pounds and now wanted to go back to trucking, but he needed copies of his medical record to prove he was fit. I interrupted then, "You are a vet, and you can get those records via the Blue Button." He was happy to hear that there was a way to access them. As we rode into Hot Springs the very green trees that loomed above us amazed me. I left the cabbie with my well wishes and entered the convention center. The Hot Springs Convention Center is beautiful. It is built like a wedge upon a sloping hill. When you walk from end to the other, you begin at great height but as you walk down a very long hall you arrive at a conference space at ground level. The space is filled with art. It is not pretty art. By that I mean it is beautiful, tragic and profound, but not the safe pretty art work that graces so many public buildings. When I reached the conference space, Janna Williams and her team greeted me. 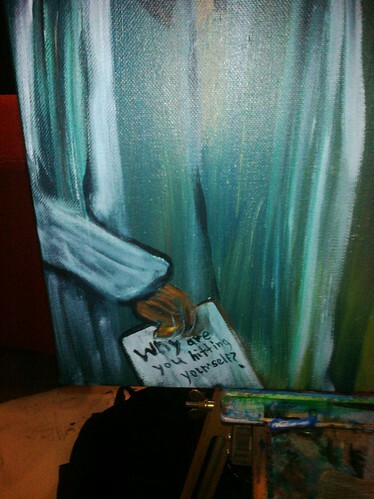 Then I began to paint. 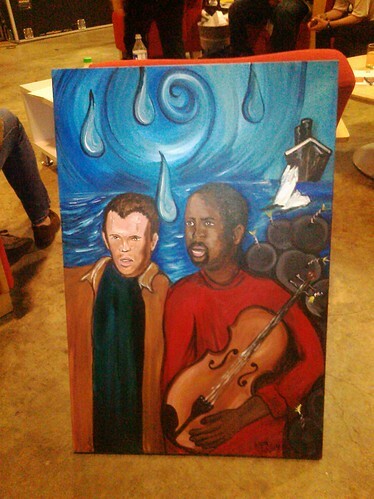 I set up my easel in the vender area and began a painting I called "The Natural State." In this painting the beautiful green trees loom large before the viewer. A road stretches into the distance to meet a far off horizon. 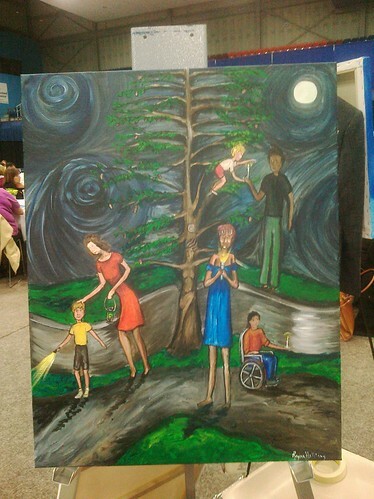 I painted all of this and then the award banquet began. 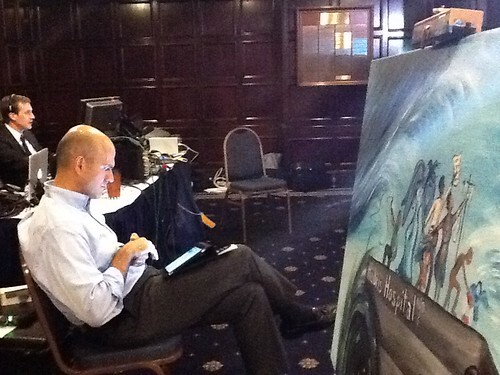 I moved my easel down the hall and set up once again in the main Ballroom. I watched the awards unfold as one facility was awarded for a quality project. The facility staff had decided to encourage medical students to call patients post-discharge and find out how the patients were coping. This way they could determine if the patients needed additional help. This practice substantially reduced readmission rates. 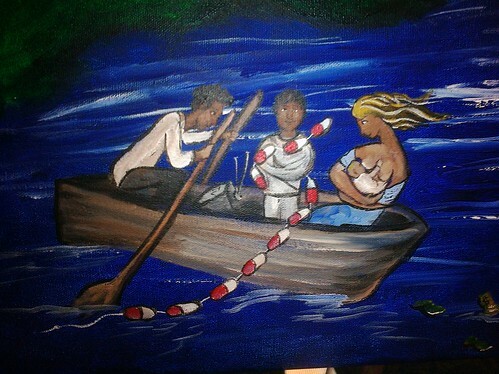 So within the painting ,I placed a patient on the road of care looking bewildered and confused. One student pulls her arm, dragging her forward to her health goal. This student seems as eager as a child. The other student touches her arm as she tries to reach the patient by using a telephone. Then I stopped painting for the night and spent a delightful evening in the company of my Aunt Minnie and my sister Esther. 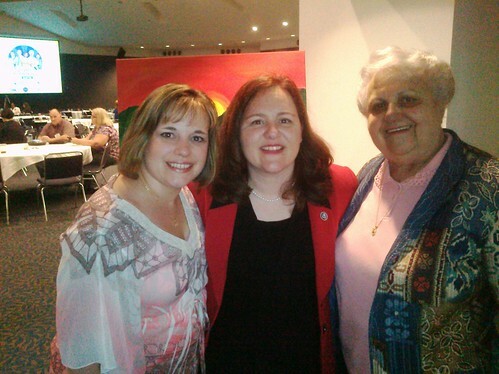 They had driven up from Enid, Oklahoma to see my speech and enjoy a day trip in Hot Springs. My aunt Minnie is a retired ICU nurse and my sister works for the State of Oklahoma in adult protective services, so I knew they would be interested in the medical conference. I presented on my speech April 18. There were other speakers before me. Ray Hanley, President and CEO, Arkansas Foundation for Medical Care, J. Gary Wheeler, MD, Professor of Pediatrics, UAMS College of Medicine and Andy Allison, PhD, Director, Division of Medical Services Arkansas DHS gave speeches that soared one around the other and told us many things. 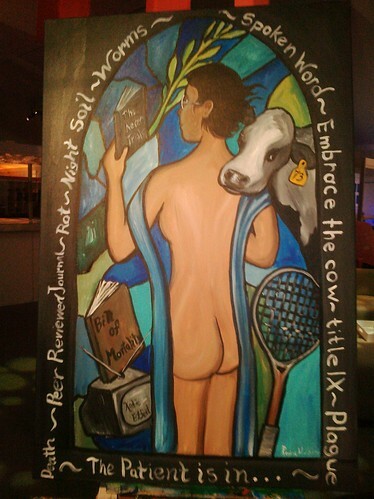 They spoke of “The Moral Energy” that can regulate healthcare and it became the title of this piece. Once we depended on the doctor’s Hippocratic oath to provide safeguards in medical care. Now we expect legislation to augment the doctor’s oath and create a moral energy in patient centered healthcare. 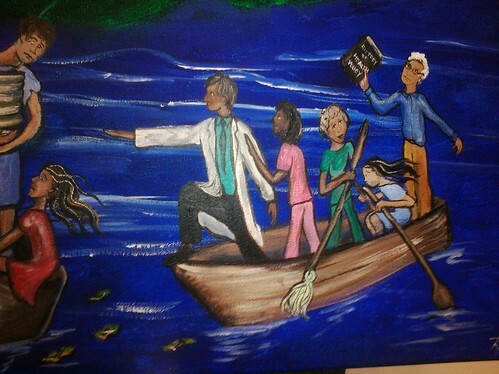 To the left of the patient, a doctor is rowing a boat. As he presses forward with his oars he is staring at a television. He wants patients to decide upon their healthcare choices with as much forethought as they choose a television. He also wants data sets to be open so patients will have the resources to do such research. 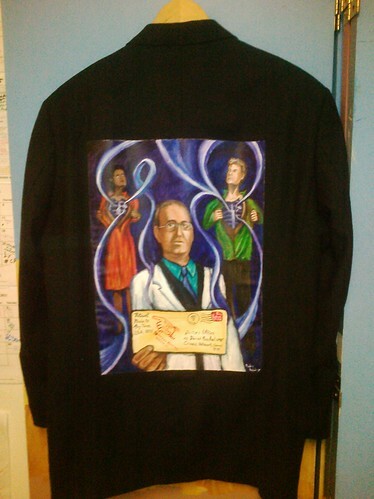 To the doctor’s right a five-year-old child is in a straight jacket. He has a string of anti-psychotic medication twisted around his body. He represents an attempt to curtail the over prescribing of anti-psychotics to children in the state of Arkansas. To the child’s right a young mother is nursing her baby in a facility that has realized the benefits of providing lactation support far outweigh and the loss of productivity that was once ensured by placing a bottle in every squalling mouth. To the right of the patient boat, a care team boat is being rowed into the picture. The doctor is reaching out to the patient supported by the nurse and even the housekeeper is part of the team. At the oars a patient rows energetically for the patient is part of the care team as well. So within the painting I added Len with a history book in hand reminding us that if we forget our history we are destined to repeat it. I spoke next and the speech was well received. 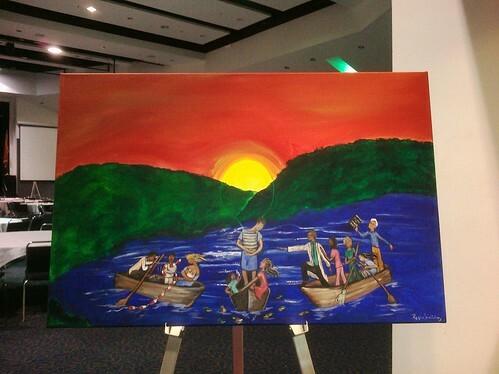 Then we raffled off the painting “The Natural State” and an Oklahoma State alumnus won the piece. I said thank you to all the amazing folks in Arkansas and hugged my family goodbye. I hoped in a shuttle to head back to the airport. The driver was a very nice fellow with four children: two in college, one in high school and one in third grade. When he realized the event was a medical conference, he asked me what was my take on “Obamacare.” I proceeded to spend the next 40 minutes explaining the Affordable Care Act and its many provisions to help regular folks. I also threw in a little information about HITECH and Meaningful Use. When I finished, he said all that sounded really good. So, why didn’t they explain it that way on television? 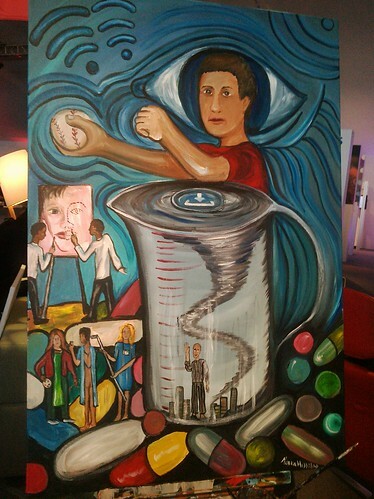 This is the final painting of TEDMED 2012. 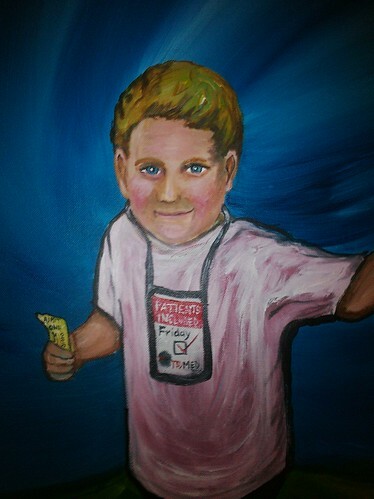 It is entitled “One Day Pass.” It represents all the patients who proudly and happily attended the Friday session. They had special badges they wore around their necks and they were so honored to be there. I based this little happy patient on my son Isaac who lost his father when he was only 3. And for the past few days has barely seen his mother as I painted 14 hours each day in an attempt to create 12 paintings in a little less than four days. 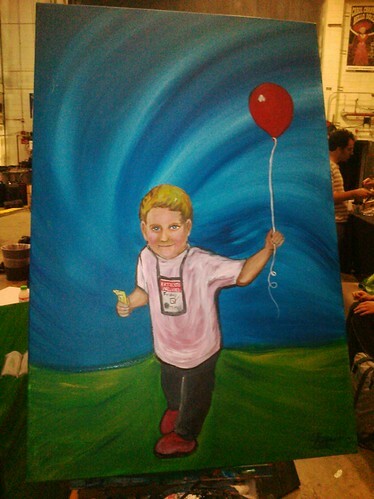 He holds his balloon of hope with a gracious joy. He is so happy to play with you. He is so glad for his one-day pass. 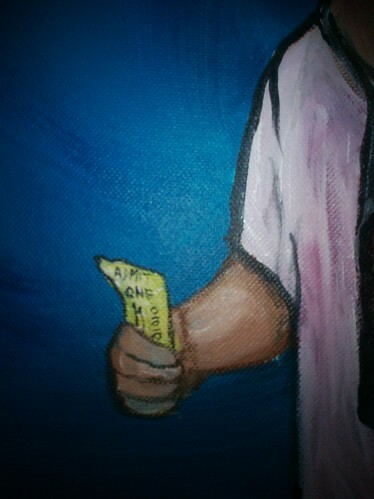 In one chubby hand he holds the golden ticket: Admit One. Around his neck his badge says TEDMED Patients included. That is a rather important label. That means TEDMED invited patients to help design this conference, put patients on the stage and invited patients to attend. And do you know what? They did. 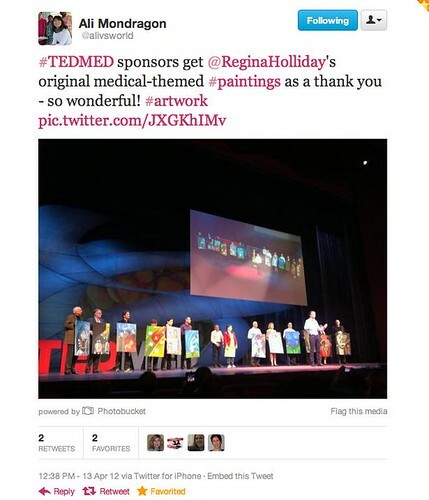 Shirley Bergin and I shared over 100 emails planning how to incorporate the patient voice through paint and twitter at TEDMED. 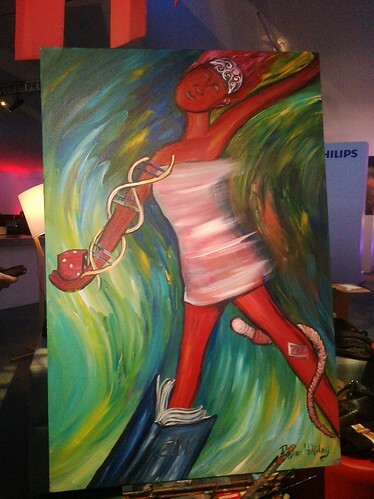 Did you see Shirley on the stage the final day of TEDMED? She ran virtually everything, but still made time for patients. We saw several patients on the stage at TEDMED 2012, and hopefully in coming years we will see many more. We will see more because some patients famous for their advocacy will cross this stage. But we will see them in another way. 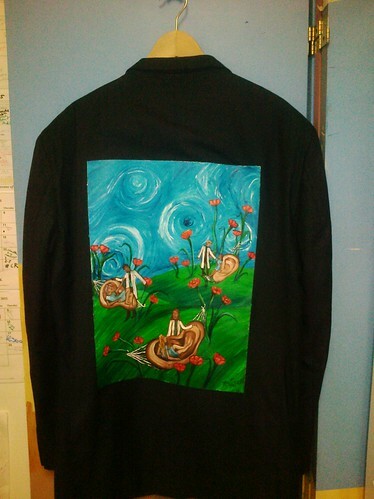 It is a way The Walking Gallery members are all too familiar with. 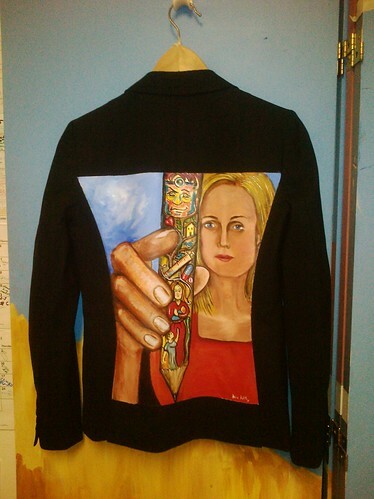 People are often surprised to hear ¾ of The Walking Gallery is made of providers, techies and governmental employees who self define from the patient view. There will be more patients on this stage as we each embrace our patient self. We need to take time to hug that little guy inside of each and every one of us. At the close of TEDMED CEO Jose Suarez thanked us all. 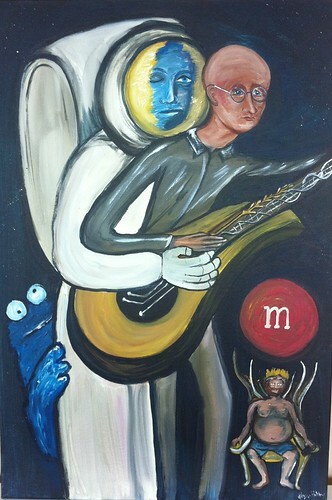 He asked me to come upon stage and bestow these paintings to the 12 major sponsors for TEDMED. In the next 15 minutes a half-circle of patient art formed upon that stage and was shown on 2,000 screens across this nation. “One Day Pass” was given to Johnson &Johnson for their support of TEDMED. 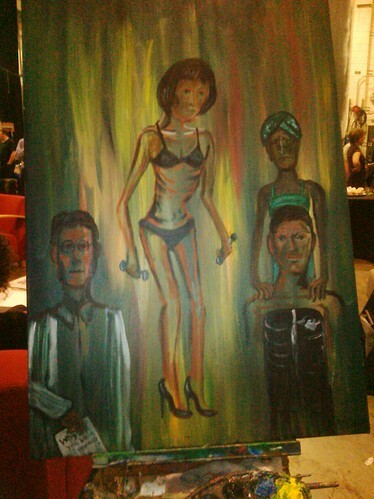 I painted this backstage while I was surrounded by the easy camaraderie of entertainers and backstage crew. This was the final session of a long show. The day began will Jill Sobule leaving her soft chair and crossing the stage. She began with a song that went “Ritalin Boy, Ritalin Boy, oh, look a squirrel!” I laughed at that, as I have two very active sons and could relate. 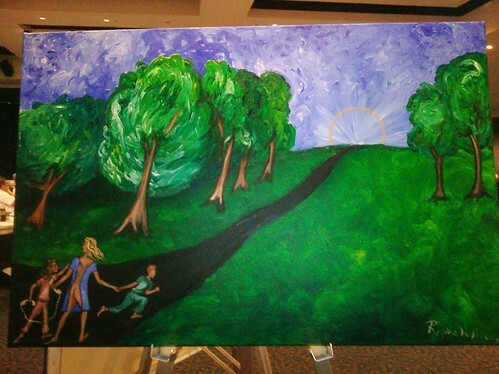 And when she met her maker, he said "come right in"
"I'll show you around the gym"
I painted Lucy in the center of this canvas and titled this piece “The First is Last.” Here on the final session of the final day we were speaking about emotions and the underlying sorrow that can affect our health outcomes. Jill Sobule was followed by Dr. Jay Lombard, MD and Chief Scientific Officer at Genomind. He furthered the conversation that Jill began as he talked of the final frontier in health: biomarkers for psychiatric conditions. Leslie Saxon, MD Executive Director and Founder of USC Center for Body Computing spoke about the future of implantable wireless heart devices. I was saddened that I did not hear her address the need for patients to access this data just as much as the provider and the manufacturer. Patients such as Hugo Campos fight daily for access to the data of these devices implanted within their very own bodies. 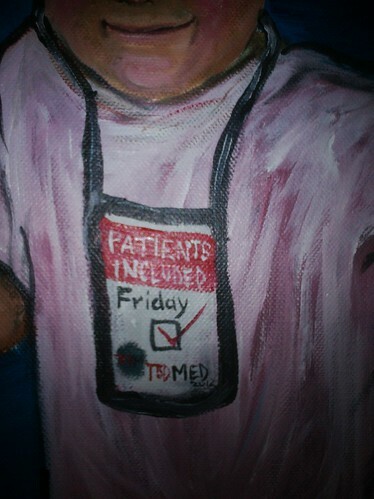 So I painted a patient with a heart device looking stoically from the canvas. Mark Hyman, Founder and Chairman of the Institute of Functional Medicine, spoke next. He delivered an amazing speech about the coming epidemic of “Diabesity.” He spoke of his time in Haiti and his questions to the local doctors. He was surprised to hear the most common diagnosis in pre-earthquake Haiti was diabetes. He spoke about the effects of over medication, lack of exercise and poor food choices. He said such a path was killing us. But gave us a thread of hope as he spoke of Project Daniel, a program that helped entire Church congregations’ loose weight, he added it is not your parent’s weight that effects you as much as your friends. Community can save your life. 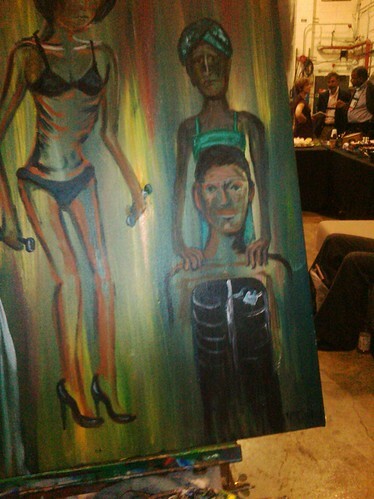 So a woman from Haiti holds the shoulders of another figure in the frame. But that is the only human contact within this piece. The colors are so dark. Lucy looks so lost. I wish that I could save her. 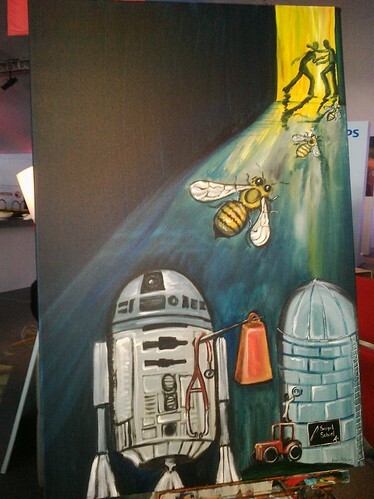 This painting was given to Steelcase and Nurture for their support for TEDMED. 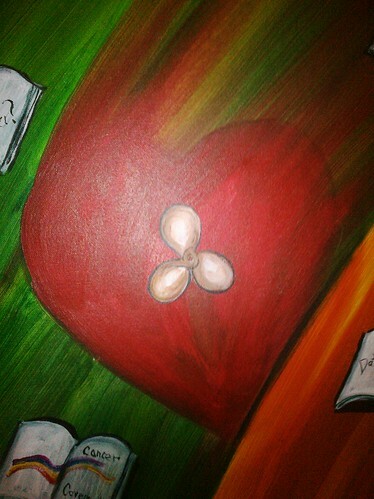 It was Friday the 13th and I was painting a heart upon the 10th canvas. This day we saw the co-creator of TEDMED, Marc Hodosh take the stage and proceed to guide the following talk. Bud Frazier, MD Director of Cardiovascular Surgery Research and Billy Cohn, MD Director of Minimally Invasive Surgical Technology at the Texas Heart Institute gave an amazing lecture. They started with showing us flying birds, a method that inspired man that flight was possible. They went on to say that nature has limited resources and used what she had for flight. Humans quickly discarded this method for propeller driven flight. Just as this method worked better for artificial flight Drs. Frazier and Cohn proposed we must look at the pumping human heart in the same way. Must it pump? Or was that nature’s trade off for what she created. As they engineer artificial hearts with minimally moving parts recipients will have no pulse, but will live with hearts that can function for 20 years inside of their bodies. So this painting was inspired by “Flight.” In the center the heart almost seems to spin as the propeller rests in silence before it. The colors chosen represent the colors in a traditional traffic light as designers and medical professionals must decide when to stop when to go and when to go very, very fast . Jay Walker then presented an amazing image of an ancient medical text describing the color of urine; he followed that with an exquisitely detailed image of an entire town witnessing a dissection from surgeons to priests. Next Dan Perry, CEO of the Alliance for Aging Research, discussed the future of aging. I added another book to our image with the words “aging and disease.” I found elements of his speech disquieting as we already live in a society that is very death averse and aging is viewed in a similar light. As he spoke of aging as a disease that could be treated, I wondered how people would fare emotionally if the gentle steps we take toward death as our age advances were removed. Lynda Chin, MD of the MD Anderson Cancer Center spoke about the breaking of cancer covenant. 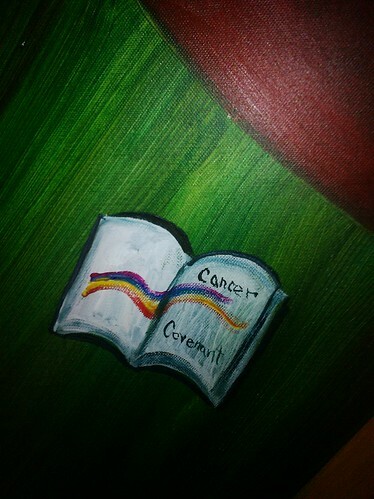 So a new book entered the painting and we learned about the self-serving molecular nature of cancer cells. Atul Butte, MD Stanford spoke next and mentioned that advanced mathematics might replace the scientific method. He envisioned a future where resources used and clinical trials begun after intensive mathematical modeling supports that this type of research path is most likely successful. 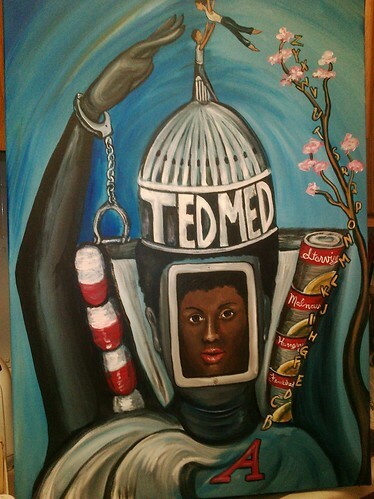 This painting was given to The California Endowment for their support and sponsorship of TEDMED. Still fighting the good fight.